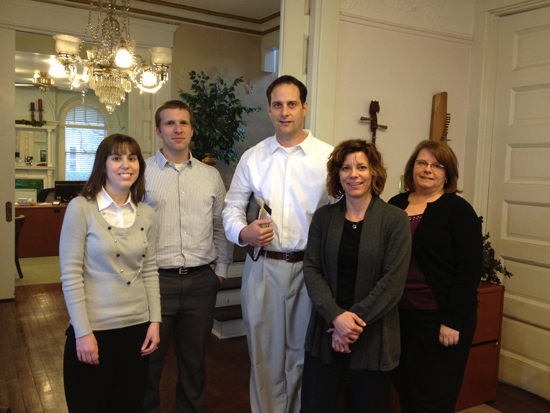 OffWhite welcomes Paul Chambre to our Marietta, OH offices for a planning session on Thursday, February 23, 2012. Pausing for a photo following a long and productive day in our third floor conference room at, left-to-right, Jane Cirigliano, Nat Miller, Paul Chambre, Abby Spung and Jodie Reiter. Air Science has chosen OffWhite to help manage their worldwide integrated marketing program including technical literature, website and e-campaign solutions information management. Headquartered in Fort Myers, FL, Air Science is a manufacturer of ductless fume hoods, vapor and particulate air filtration products and forensic investigation preparation, storage and processing systems. Air Science products are used worldwide in laboratories and processing facilities associated with environmental science, chemical testing and processing, forensics, secondary and university education and other applications where protection from chemicals or pathogens is necessary. Offenberger & White, Inc. (OffWhite) celebrated the company's 27th anniversary on Wednesday, February 8, 2012 with an informal lunch and retrospective with retired company co-founder Warren Offenberger. 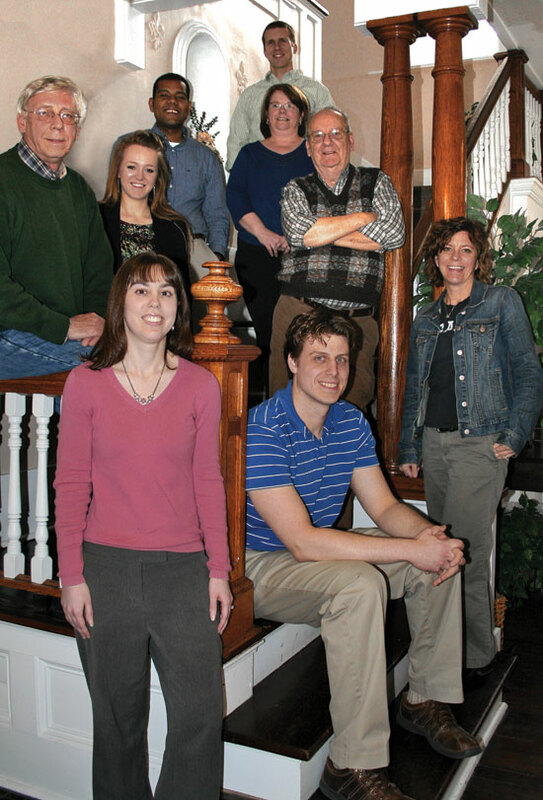 Pictured in the OffWhite historic Fort Street offices in Marietta are, front row, l/r, Jane Cirigliano, Chris Hlubb, Abby Spung; second row, l/r, Bill White, Danica Cunningham, Warren Offenberger; third row, l/r Steven Hollis, Jodie Reiter, with Nat Miller in the back. Offenberger & White, Inc. (OffWhite) announced today the addition of Danica Cunningham, of Mineral Wells, W.Va., as the company's new intern. The position with OffWhite will afford Cunningham the opportunity to gain real-world experience with an established, full-service integrated marketing communications firm. Specifically, Cunningham will assist in the planning, promotion and implementation of the company’s Ed.it™2 content management system, designed to provide non-technical users with a powerful and flexible way to maintain their website. Cunningham's prior experience includes serving as the Marketing and Public Relations Intern for the Harmar Community Center. 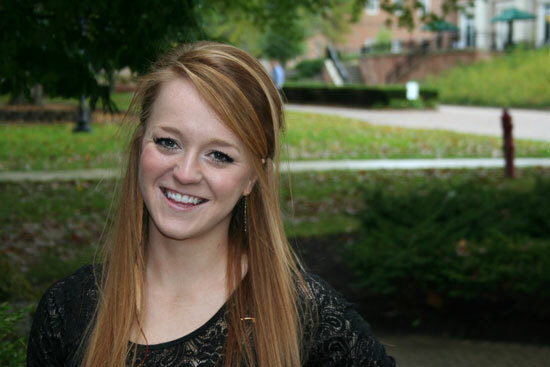 She is currently pursuing a Bachelor's degree in Organizational Communication/Public Relations at Marietta College with minors in Political Science and Marketing and an anticipated graduation date in May 2012. "I am grateful for the opportunity to work with talented industry leaders through my internship with OffWhite," said Cunningham. "I will gain a great deal through the experience, and I hope that OffWhite will also see gains from having me as a part of the team." It was a cold day in February, 1985, when Warren Offenberger and I launched Offenberger and White, Inc. with a borrowed typewriter, a piano bench for a desk, some felt markers and rubber cement, guts and optimism. Ten minutes after our first phone was installed, someone called and asked for OffWhite. It’s been that way ever since – a great ride and getting better. OffWhite has the best combination of talent, brains, energy and commitment that I’ve seen in our 27 years in business. We’re renewed each morning by our own ideas, challenges from our clients and opportunities enabled by our investment in technology. Everything we do at OffWhite has a job number. Our stock in trade is based on time and materials and our lives, as TS Eliot understated, are measured out in coffee spoons. We call these time sheets. OffWhite reached a milestone this week, nearly 27 years in the making, when Jodie opened project number 10,000, a job to prepare and present a proposal based on discussions with a new client here last Friday. As always, it’s a technology-based project, ideal for who we are and what we do, rich in detail and waiting to be explained, articulated and sold to the market. Thanks to everyone at OffWhite for continued and enthusiastic efforts to build our firm into one of the easiest companies to do business with, one of Southeastern Ohio’s most valuable business resources and one of America’s most innovative idea engines for life science and technology marketing. Together we are setting new standards internally and for our clients around the world. With ideas like these we can expect an ambitious journey to project number 20,000. So, what was job number one? For the record, February 1985, OW00001 was opened for the Walker Technical Users’ Catalog. Walker, long since absorbed into the Wiremold family of power, lighting, electronics and communications component manufacturers, exemplified a client relationship that continues to be a model for partnering with people who know what they’re doing and care about the outcomes. Today, OffWhite remains rooted in the values, processes and commitment to clients that we brought in the door that cold day 27 years ago. We owe many people for our success. Onward.